Not everyone reaches adulthood with a set of perfectly straight teeth. The benefit of adulthood is that we often have the money to actually fix our teeth and begin the journey towards a perfect smile. Of course, the thought of having braces fitted during adulthood can also be a little intimidating. It doesn’t have to be, and with modern technology, adult braces really aren’t as terrifying as they used to be. Here’s a look at the processes involved in fixing your teeth with adult braces. Adult braces refer to a range of orthodontic treatments that are designed to treat dental issues within adults. The most well-known, and common, form of adult braces are the braces that adolescents are usually fitted with. Fixed Braces: The most common form of adult braces. This treatment usually takes between 12-36 months. Inman Aligner: This orthodontic treatment is visible and straightens teeth by applying force via a metal bar and a coiled spring. Results can be achieved very quickly, with a noticeable difference often visible immediately, and full treatment completion usually possible within 16-20 weeks. Lingual Braces: These are a popular option for adults as they are invisible. Instead of being affixed to the front of the teeth, they are placed on the back making them completely invisible when smiling. However, not all cases are suitable as there may not be enough room behind the front teeth to accommodate the braces. Retainers are often used after these treatments to ensure the orthodontic work isn’t reversed. What Conditions do Adults Braces Treat? Abnormal Bite: An abnormal bite or ‘occlusion’ is an issue with the way the top and bottom teeth meet. In a proper bite, the bottom teeth will neatly fit over the bottom teeth, but if the jaws come together in an over or underbite, it can cause a range of issues, including increased risk of gum disease and tooth decay, and even jaw pain and speech defects. Crowded Teeth: Several factors can cause overcrowded teeth, ranging from occlusion to dental trauma and even tooth size. If not treated it can cause jaw and joint pain, as well as premature dental wear. Gaps Between Teeth: Gaps between teeth aren’t just an aesthetic issue, they can also lead to severe gum disease. Gaps can be caused by a range of issues including malocclusion, misshapen teeth and even the size of teeth. Treating gaps in teeth can prevent advanced stages of gum disease, such as periodontal disease. Twisted Teeth: Overcrowding or issues with jaw sizing can cause twisted teeth. The problem with twisted teeth is that it makes it difficult to clean in between teeth, which opens you up to tooth decay and gum disease. The first step in our procedure is a consultation and x-ray session, where we check the health of your teeth and get a sense for what you want to achieve from your treatment. Following this consultation, a treatment plan will be formulated, and your journey towards straight teeth begins! It takes between 1-2 hours to actually fit the braces. The first step involves a thorough cleaning of your teeth. This is essential in preventing any plaque or tartar from being trapped underneath the braces. 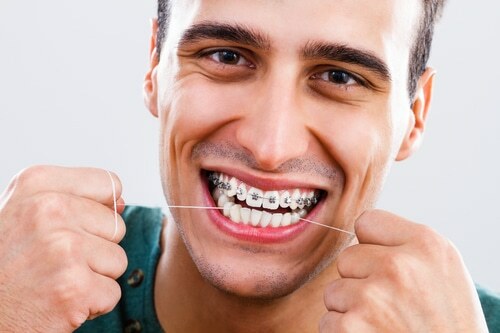 Once the teeth are clean, the orthodontist will use bonding glue to attach the brackets before utilising the archwire to connect the teeth. The final process involves securing the archwire with elastic bands. Only eat soft foods for the first couple of days. Use OTC pain medication, prescription medicines will not usually be necessary. Use orthodontic wax to avoid mouth sores. It will only take a couple of weeks for you to get used to the braces, but if issues persist, don’t hesitate to get in touch with us. We can always figure out a solution. Invisalign is a proven alternative to adult braces. They perform the same function while being completely invisible, which is excellent for those who are worried about the aesthetics of fixed braces. The treatment works in stages, and each mould is matched to your teeth. As you progress through the moulds, your teeth become straighter and straighter until you reach your desired level.